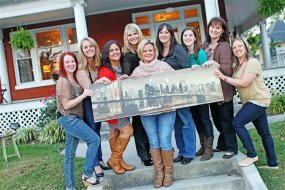 Scrappin' in the City originally started out as a group of friends who thoroughly enjoyed scrapbooking and paper crafting together. This passion eventually grew into a business that specializes in providing customers with the ultimate paper crafting experience! Here, customers enjoy shopping, socializing, weekly classes, monthly crops, and special retreats throughout the year. Customers affectionately refer to us as the "City Chicks", so you will see an image of a bird on almost everything we do! You'll find us in a trendy, boutique-style shop in the heart of Knoxville, TN, in an historic home. We're known for remembering customer names (you might say we're like a "Cheers" for women), as well as treating them as friends and valued members of our growing paper crafting community. In addition to regularly attending trade shows, we're continually learning in order to stay current with the latest industry trends and newest product releases so we can pass our knowledge along to our customers and provide them with a never ending supply of creative possibilities. Our goal is to encourage all paper crafting enthusiasts, no matter their age, style, or skill level, to continually expand their imagination and improve their skills. We strive to maintain a store atmosphere that inspires creativity, encourages learning, and promotes fun! Whether they're shopping or cropping, we want our customers to think of our store as their "happy place"...a place to hang out, nourish their artistic spirit, make new friends, and indulge their passion for paper crafting and preserving memories!